Contacts rated for 40 amps at 500 Volts A.C.
Base and cover have machined surface to protect the limit switch against dust. The mechanism or the drive coupled to the limit switch actuates the contacts through the worm gear drive and the cams. 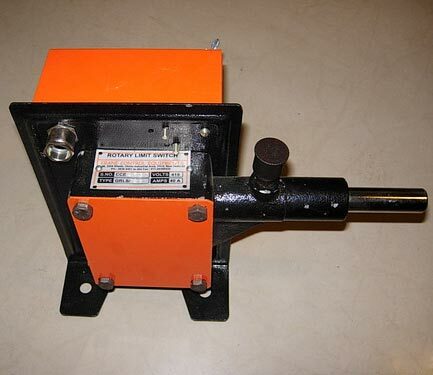 This immediately opens the contacts and the circuit is broken there by disconnecting the respective motor from the supply and resulting in the stoppage of the drive or mechanism. The actuator or cam is provided with a maximum follow-through angle of 60 degrees there by ensuring that the normally closed contact, which has been opened by the actuator/cam, shall remain in the open position for at least 7 full additional revolutions of the input shaft. This provision is adequate for most of the reversing drives where the mechanism or drive comes to a complete stop with in 1/5th of a revolution of the input shaft of the limit switch.